Most motorcycle accidents occur during a short trip associated with shopping, errands, friends, entertainment, or recreation, and usually occurs very shortly after the beginning of the trip. Cardinal, the brand of smart navigation gloves for female motor cyclers. Provide navigation assistance by synching to Waze and GoogleMaps with bluetooth. Light technology provides visual signal and premium material + fit. The rise of female bike riders: so many more bikes on the road and so many more female riders than before. Products for female bikers are lacking. The current motorcycle market for women is followed by “Shrink it or pink it” mindset. commuter riders need navigation assistance to help them adapt to traffic, take new routes, and get to know new destinations in style. How might we provide an easy and safe navigation system for women who don’t want to compromise on style and protection? Cardinal is a smart navigation gloves “for life in the fast lane on two wheels.” The gloves are specifically designed with the female urban motorcyclist in mind. They provide an easy and safe navigation system for women who don’t want to compromise on style and protection. 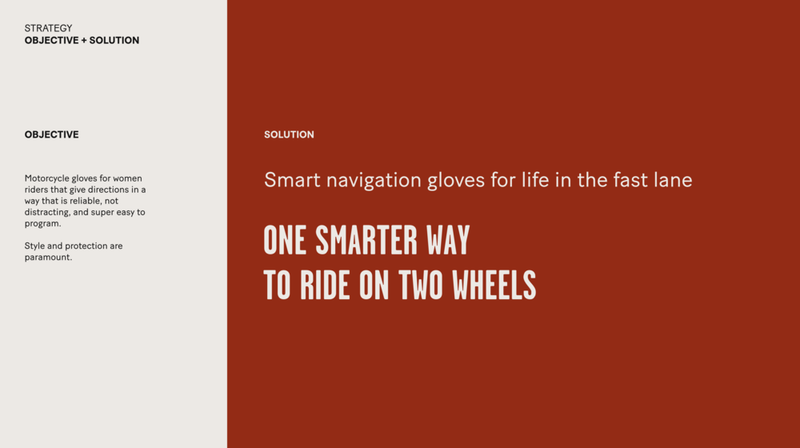 Users can sync their Cardinal gloves to Google Maps or Waze with the built-in Bluetooth, and the OLED screen in the glove can then provide a visual signal—indicating where riders need to turn—while a progress bar indicates distance from the turn. Complacency: Taking the same exact route each day can turn riders on to auto-pilot. On the Road When Everyone Else Too: Most motorcycle injuries and deaths happen on weekdays between 3-6pm. Getting Too Comfortable: People get comfortable close to home and stop paying attention to the road. Studies show that riders are most likely to crash within 25-mile radius of their homes. Forgetting to Use Turn Signals: Failure to use turn signals is the leading cause of vehicle accidents. On average it causes 2M accidents per year. Most common reason for not using a turn signal is forgetfulness. Your hands are often the first thing to hit the ground in an accident, so I recommend specifying that the electronics enclosure also functions as hand armor. Conflict Between Fashion Aesthetic and Safe/Function Black fashion is cool but unsafe. It’s difficult to protect yourself in warm weather while staying comfortable. 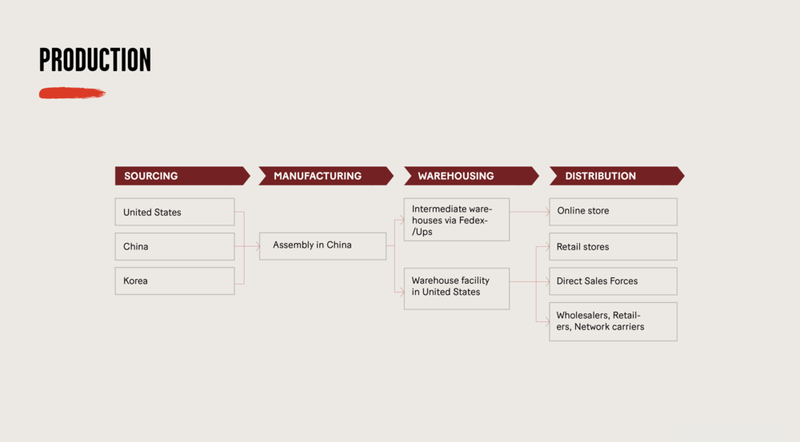 Word of Mouth Is Crucial Many purchases are made via word-of-mouth recommendations from other riders; it’s difficult to get product information when shopping online or in stores. Women Are ‘Filling the Gap’ Themselves Women riders are finding their own hacks and workarounds to address the lack of available products. 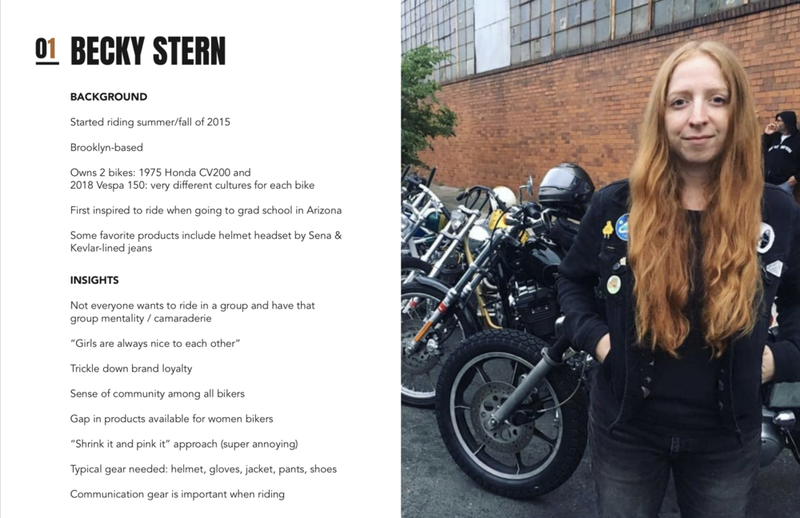 We conducted market research looking at current women’s motorcycle gloves and related products. We read the reviews online at Amazon.com from users. Our key takeaways are that Bluetooth helmets are effective but provide no visual cues and phone mounts are popular but risky. Gloves are one of the harder pieces in the commuter repertoire to balance style and function gracefully. Validating the concept and designing functionality of the glove (the hardware and UX of the navigation systems) were our first priorities. Through a team brainstorming and working session, we formulated several variations of where the navigation would be placed on the glove, what the display would look like, and how it would operate. 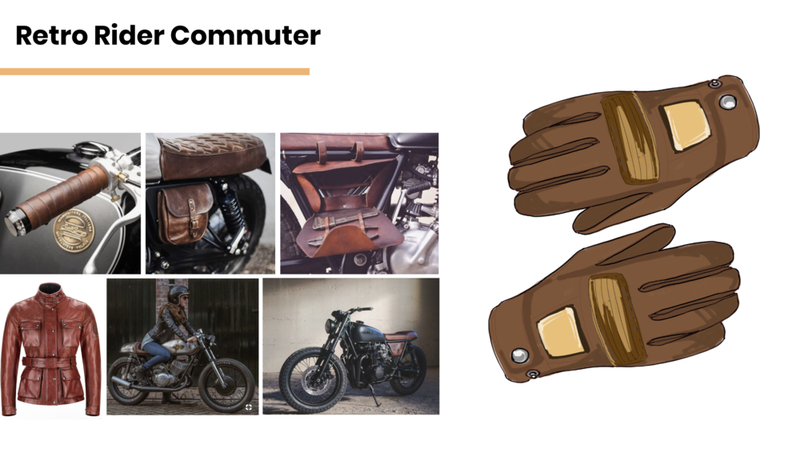 We each created an animated sketch and a quick glove prototype after that discussion, and those prototypes allowed us to get further feedback from riders. 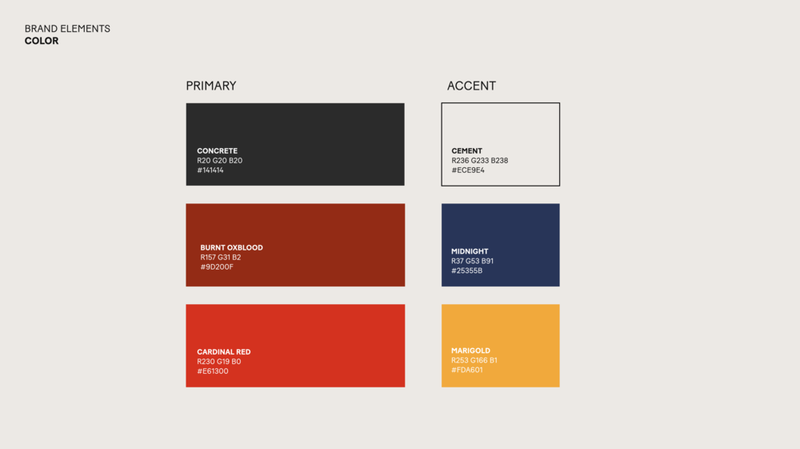 To make Cardinal even more real, we created a brand style guide that captures the attitude of the product and the community that inspired it. 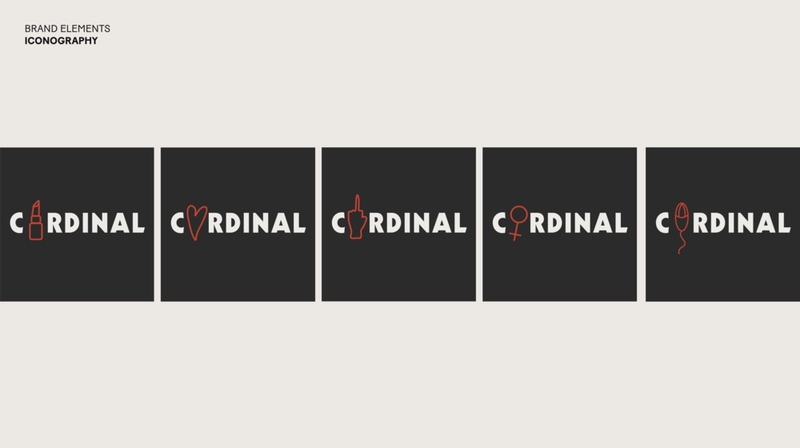 As with all companies—from start ups to established industry giants—Cardinal has guidelines for its tone of voice, personality, brand values, logo, color palette, typography and graphic iconography. 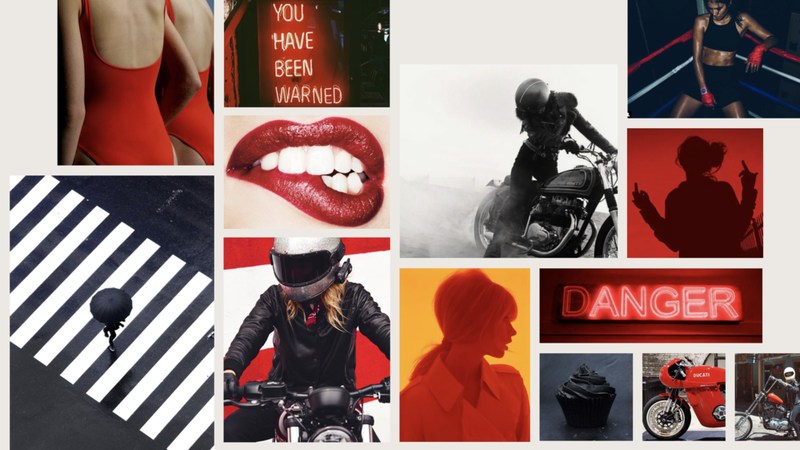 The guidelines can be seen in action in our NARS campaign, which promotes the launch of our signature and very badass "Cardinal Red" lip color. I am really thankful for our great instructor, Hlynur Atlason, and designers from Atlason Studio who gave us many valuable suggestions during the course. I had a wonderful time working with my three teammates: Evie, Antya, and Ellen, and I learned a lot from them as well. More Care for Subcultures: At the beginning of the course, we started out design subject from looking at different subcultures. We found that motorcycle is very popular among the societies. However, the products for female bikers are lacking. Because in the masculine motorcycle world, female products are followed the concept “shrink it or pink it”. 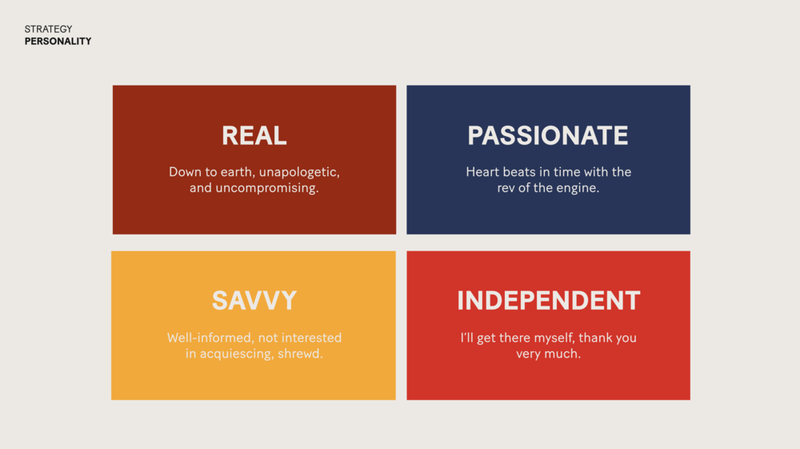 I think this project is a great start for me as a designer to pay more attention to the subcultures in the future. 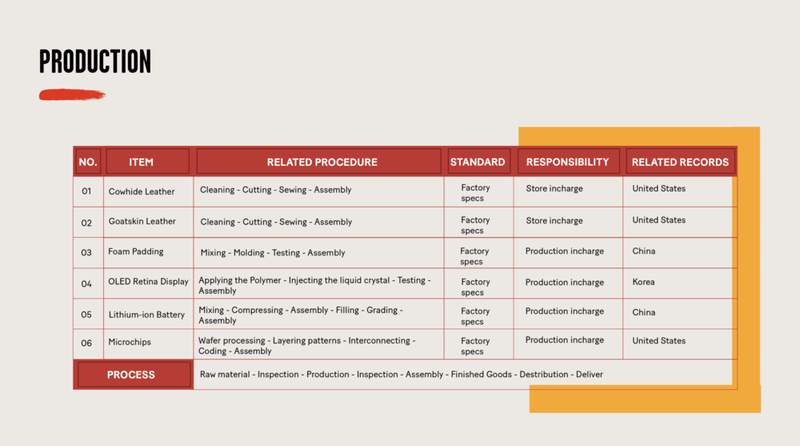 Integrated Design Strategy + Materials: Different from digital products, designing physical products required designers to think about materials, production plan, distribution plans and so on. We paid a visit to a prototype plant in Queens, New York during the course, they are professional for making authentic samples and we gained a lot of knowledge of materials and machines. Team management and collaborations: We have vote system in every stage of the design process and we have constant meetings online and in person. We also follow the rule “No Prototype No Meeting”, means each of us needs to prepare works before the meeting so that our meetings will be productive.